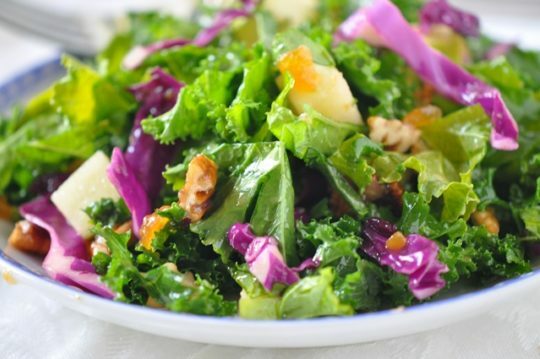 Kale is all the rage and you’ll if you give kale a try with this salad, you’ll understand why!!! An intriguing salad with an extraordinary tasty flavor combination. This recipe is from Holly Clegg’s trim&TERRIFIC Eating Well to Fight Arthritis. Perfect blend of sweet and savory flavors. In large bowl, toss together kale, cabbage, fruit and pecans. Toss with Fruity Vinaigrette (see recipe). Terrific Tip: Look for pre-chopped kale in bags at the grocery for short-cut. Nutrition Nugget: 1 cup of kale provides a whopping 5 grams of fiber, 15% of your daily calcium recommended intake, 180% of vitamin A, and 200% of vitamin C! Recipe from Holly Clegg’s trim&TERRIFIC Eating Well to Fight Arthritis. Visit Holly’s YouTube channel and website or blog for more recipes and tips.